Kurt Warner will turn 47 years old in June. His last NFL snap came at the end of the 2009 season. You would think the time for Warner to consider an NFL comeback would have passed long ago, but you’d be wrong. Appearing in the St. Louis Cardinals broadcast booth during Monday night’s game, Warner casually told a story about talking to an NFL coach about coming back to play this season (h/t to Patrick Daugherty of Rotoworld/NBC Sports). Since we all thought Warner was completely done long ago, that is a surprise. Before we start giving all the qualifiers to Warner’s comments, let’s get it out of the way: We’re all thinking it was Oakland Raiders coach Jon Gruden — who seems to be collecting old free agents like he’s building a football ark — who he was talking to, right? Now, just because Warner was talking to anyone doesn’t mean that it was ever a remote possibility. And since Warner admits it doesn’t seem he was taken seriously, who knows how far along this idea ever really got. I’m sure if you polled Pro Football Hall of Famers, they’ve all had fleeting fantasies of a comeback (it’s not even the first time Warner has floated a comeback possibility). They’re not wired to admit they can’t play anymore. The conversation started during Warner’s appearance in the booth during the top of the third inning when he was asked if he missed playing. Still, it’s funny to think about Warner coming back to play (and he has some extra time now that ESPN chose Jason Witten over him for the “Monday Night Football” gig). 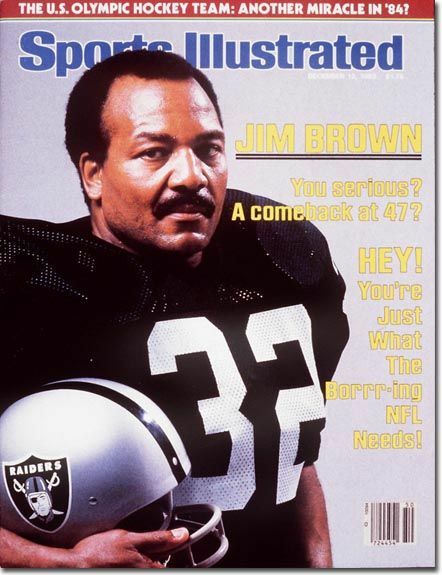 Sports Illustrated had a memorable cover touting Jim Brown’s comeback threat in 1983 when he was 47, so we’ve been down this road before. Herschel Walker once said in his 50s he could still play in the NFL, and somewhere at this moment Terrell Owens is telling someone he can still be a productive NFL receiver. Warner, who was in St. Louis for a bobblehead night at the Cardinals game, did play really well his final season … even if that was almost a decade ago. But no, we’re not going to see Warner on a football field again. Unless he gets the itch again next year at age 48 and someone actually takes him up on it.